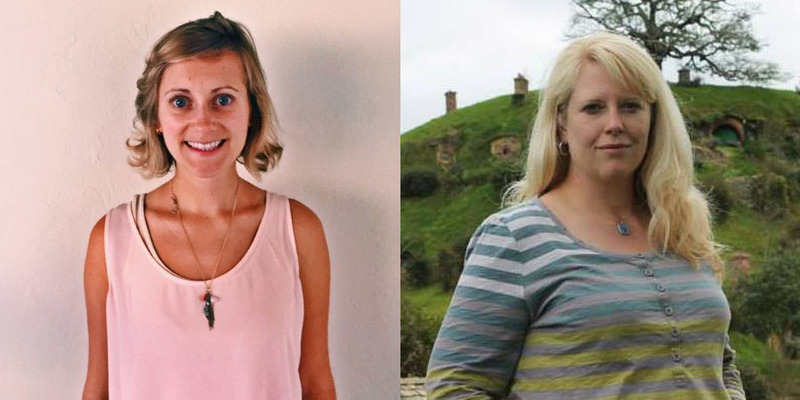 Kate Slattery and Heather Miller died Wednesday while riding their bikes in San Francisco. Photo: San Francisco Bike Coalition. There weren’t enough facepalms to go around. As reported in the San Francisco Chronicle, Mayor Lee said the city’s tireless work and the millions of dollars it has spent to make streets safer was undermined by the “incredibly irresponsible actions” of the drivers involved in the crashes. San Francisco’s bicycle infrastructure is defeated by its own employees. Photo: Streetsblog. By the way, that’s a city owned Prius blocking the bike lane on Market at 9th. Exhausted by last week’s cycle of horrors, Saturday afternoon I met up with my brother and went for a walk down Market Street to try and relax and enjoy the Pride celebrations. As readers can probably guess from the photo of the Prius, it didn’t work out that way. I watched cyclists struggling to merge into traffic to get around the Prius and I thought about the deaths of Mark Heryer and Thu Phan, who were both killed on Market Street not long ago, not far from this spot. This city employee parked his car in the bike lane on Market. Photo: Streetsblog. I asked the man in the photo above if he was experiencing an emergency. He said “no.” I asked if that was his car parked on the bike lane. He said “yes.” I explained that on Wednesday two cyclists were killed in San Francisco, and that he was creating a hazard, and that lots of people had fought for that bike lane, which he was making useless. I asked him to move the Prius. The three officers literally turned their backs on us and walked away. 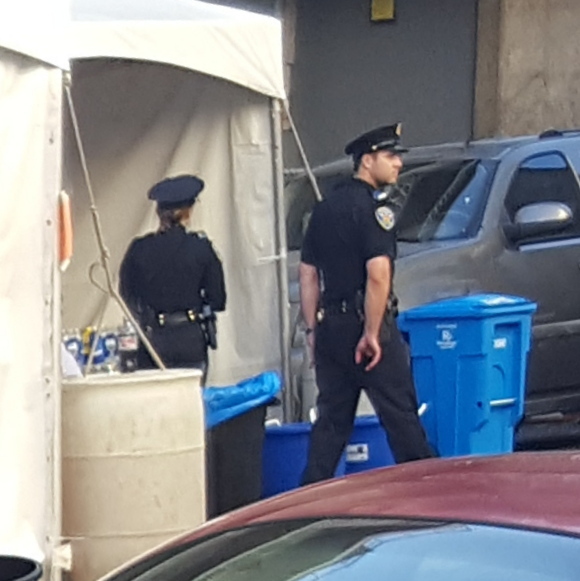 My brother continued to snap photos of these cops as they cowered behind some barricades and a tent on Larkin. Three cops, two visible here, hid and cowered when we tried to photograph them after they refused to take action to clear the bike lane on Market Street. Photo: Todd Rudick. Of course, there’s nothing unusual about the behavior my brother and I encountered. Streetsblog reader and SFBC member Adam Long even has a Youtube channel of bike lane violations. 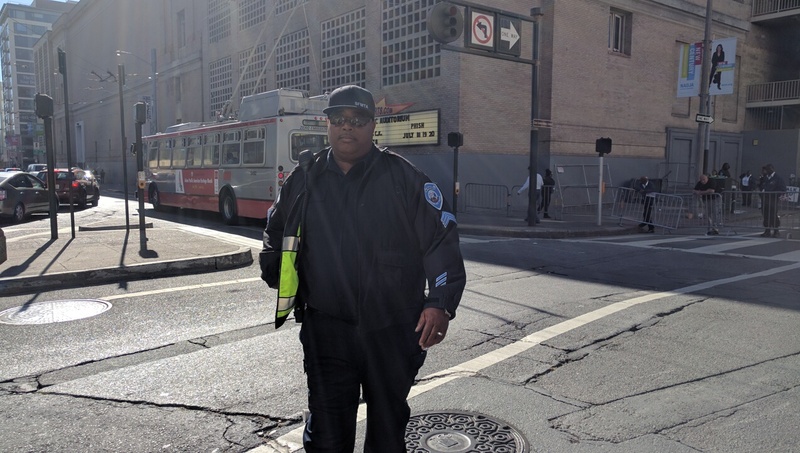 And who can forget SFPD Sergeant Ernst, who intentionally blocked a bike lane with his cruiser so he could victim blame 24-year-old Amelie Le Moullac for her own death at her own vigil? Proper protected bike lanes, with a steel rail, concrete barrier or a curb with a buffer, or various other treatments, would have saved Miller. In the case of Slattery, who was killed by a motorist who ran a red light near Seventh and Howard, it’s less clear that infrastructure could have prevented it. But what if the road was narrower at the intersection? What if there was a protected intersection and a design to give Slattery a shorter distance to travel? What if there were raised intersections and other hard-infrastructure in place to force motorists to slow? She might have had a chance. For that matter, what about the 50 dead cyclists recently commemorated in the Ride of Silence? What about the pedestrians and motorists who keep dying every week? Experiences in Europe show us that these deaths result from bad policy and bad infrastructure. Of course the primary responsibility for Wednesday’s deaths is with the motorists who were driving criminally. Yet responsibility also lies with the lawmakers, law enforcers, and other bureaucrats who refuse to do their jobs to keep us safe. But the behavior of bad officers and officials isn’t created from the bottom. It comes from the top. When officers see their own mayor parking his car illegally to get a burrito, or a cup of coffee, why should they behave any differently? My brother and I gave up on the Pride celebrations. He went to his office to do some work. I went home. It’s hard to enjoy a city where even the recent deaths of two beautiful people aren’t enough to get its employees to show a little decency, even on a day of pride. The SF Bicycle Coalition is hosting a letter-writing station to help people voice their concerns to Mayor Ed Lee in wake of fatal traffic collisions. It will be held tomorrow, Tues., June 28, 2016 from 7:30 am to 9:30 am, at 7th and Folsom, one block from the site of one of the fatalities last week. First, my understanding is that under no circumstance – except out of common courtesy, which is optional – do you need to ask anyone, let alone a police officer, for permission to take their photo. (See http://krages.com/phoright.htm). The only problem is that earlier this year, a U.S. District Court ruled that there is no first amendment protection in photographing or filming the police, so I could be contradicting myself (http://thefreethoughtproject.com/pa-federal-judge-rules-there-amendment-film-police/). Consider consulting a lawyer. As to whether bicycle infrastructure could have prevented the two crashes, I honestly am not so sure. For both scenarios, I would suggest that all motor vehicles be recalled nationwide, and these vehicles’ engines be repowered so that they cannot exceed speeds of 20mph. However, this is a long shot, and will probably remain so for as long as I’m alive. Did anyone report the SFMTA employee to 311? It should be on the official city records that they committed something wrong. Since threats of litigation are their prime concern, after re-election or reappointment, a legal challenge could work. The lawyers I’ve spoken to cite the use of writs of mandate as one possibility. Where are the advocate groups willing to pursue that? As a daily cyclist commuter, great piece, and a very level-headed approach to a very emotional subject. Sharing this with my network. Lets not forget that it was a left turning city vehicle that was used by a city employee to kill Thu Pham in February on Market Street, and that the the SFPD spokesman suggested that a city vehicle was “exempt” from turn restrictions on Market St, irregarding the fact that she was crossing with the light in a marked crosswalk and despite the fact that signage permits only commercial and taxis from turning there. So long as city employees (including the Mayor) continue to violate traffic laws, Mayor Lee will have a credibility problem when he wants to suggest that he is doing everything in his power to make our streets safer. many more bicyclists must die before you take street safety seriously? you consider even basic safety improvements? Sorry I can’t make the Tuesday city hall Vision Zero meet; I did send the following to Mayor Lee; for what little good it will do. Stop pretending that our San Francisco streets are safe for biking; they are not! You are giving bicyclist a death sentence and a false sense of safety when you propose that UNprotected bikes lanes are safe; they are not! Golden Gate Avenue being the most recent death trap for bicycles. Have you been out of your office to see the human risk that UNprotected bike lanes entails: double parking, ignored street striping, no police enforcement. Move the parking; create a PROTECTED bike lane. In 2016, San Francisco is on pace to set a new all-time high in traffic fatalities. The evening of Wed., June 22 is an unprecedented reminder of how much work is still needed to eliminate traffic deaths. Yesterday, a fire truck completely blocked the already dangerous crosswalk at Mission and France while the crew shopped for groceries at the Safeway. I commented to the crew entering the store and they just laughed and went on their way. While I was pushing my grocery cart around the truck and into traffic I asked the crew member sitting in the truck to please not park in the crosswalk. He looked right through me like I didn’t even exist. Next time: pictures. To actually affect change or to prove that you, in fact were not riding the way the cops said you were when the driver killed you. Honest question. I also considered getting a Fly6 but realized the only good it would do is that latter. And my family wouldn’t really care at that point. As far as it actually having an effect other than harvesting clicks for a youtube channel, forget it. Pictures to prove that, in fact, no one does care so you can get even more frustrated? Uber and Lyft need to update their technology to alert both rider and driver where it is safe to load and unload and that they need to meet at the nearest loading zone. A busy street with a bike lane is not a good place to get picked up. I don’t think they need technology to do this; it’s just behavior/policy change that is needed. You don’t need new technology to see a bike lane and not park/load/unload in it. right, obviously, but people are oblivious or selfish and don’t pay attention to their surroundings and rely on their phones & technology too much. I agree. There needs to be more education and enforcement regarding where to load and unload. Or, we could remove a few parking spots each block and designate them as approved rideshare loading/unloading zones. That would eliminate a lot of the excuses drivers routinely use as to why they are stopped in the middle of the road. On a positive note, I saw a delivery truck on Market today actually parked with warning cones instead of parking in the raised bike lane. That is progress. 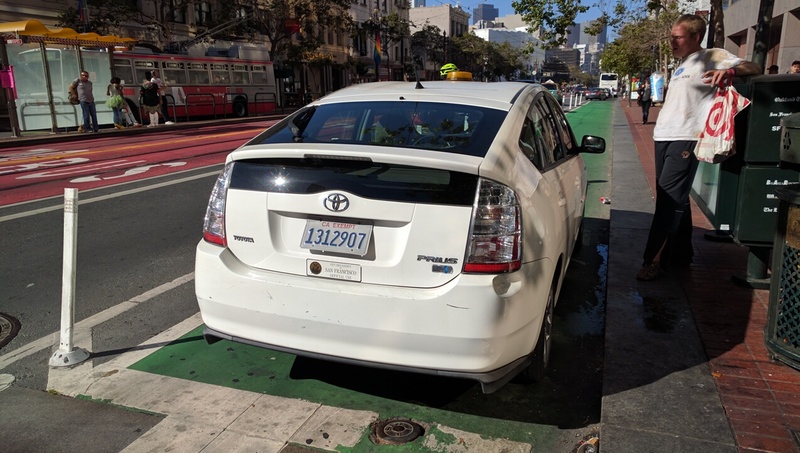 @jd_x – More than once I’ve heard an Uber/Lyft driver whine that if they don’t pull into the bike lane they’ll get a bad rating, and they’re just hard-working people making ends meet. Basically the system incentivizes only the type of legal driving that benefits the customer, many of whom can’t be bothered to walk an extra 10 feet to a legal stop. Or who stand and wait in the bike lane in the first place. The magic-o-riffic properties of a geolocated app could reject such illegal behavior. But of course the disrup-o-riffic properties of their business model prejudices them to not care in the first place. Sounds like the solution would be making the data open and fining both drivers and riders for the illegal maneuver. P.S. : One of the editors of SFist wrote a horrifying story about an Uber driver who threatened her, a conflict which stemmed from her summoning the car to the bike- and bus-only part of Duboce, next to Church. It is important to get, and publish, the names of (a) the criminal city employee, and (b) the three co-conspirator cops. Badge numbers of the cops would help too. The only way to stop criminals and corrupt cops is to splash their names across the press. I know the corrupt cops don’t like it because they fear “retaliation”. They SHOULD fear retaliation. If they don’t want retaliation, they need to either (a) do their jobs, (b) resign, or (c) be fired. Since you don’t seem to have an actual functioning police force in SF, just a gang of criminals in blue gang colors, perhaps it’s time to organize a volunteer militia to start arresting “cops”, firemen, and city officials who are breaking the law. I don’t see any way around it. So, so typical — LEO doesn’t know the actual law and doesn’t care one iota to be educated on it. Instead they make it up as they go and shove it down bicyclist’s throats. Does anyone know whatever happened to the drivers in these crimes? Farrukh Mushtak was charged with vehicular manslaughter and Nicky Garcia with murder, but I can’t figure out what happened with their trials.